We are smiling from wisker to wisker from your support for our Share the Warmth campaign. Since May 5 our North Melbourne and Campaspe shelters have seen 237 cats and kittens find loving families. This is a fantastic result and we want to thank each and every one of you who have adopted, fostered and advocated during the campaign. While their condo mates have gone onto find their forever homes, some of our long term residents are still looking and waiting patiently to find the right home for them. These are just some of our long term cats who are up for adoption at our North Melbourne and Campaspe shelters who you can meet in the fur before Share the Warmth ends on May 31. Five year-old Red Phoenix, or Red as he is affectionately known, is a gentle giant who loves nothing more than spending his days lounging around in the sunniest spot in the house. He is a confident, inquisitive cat who is quite comfortable taking his own time to scope out his surroundings before he comes to you for cuddles and smooches. Red loves going outside and enjoys spending time on walks. 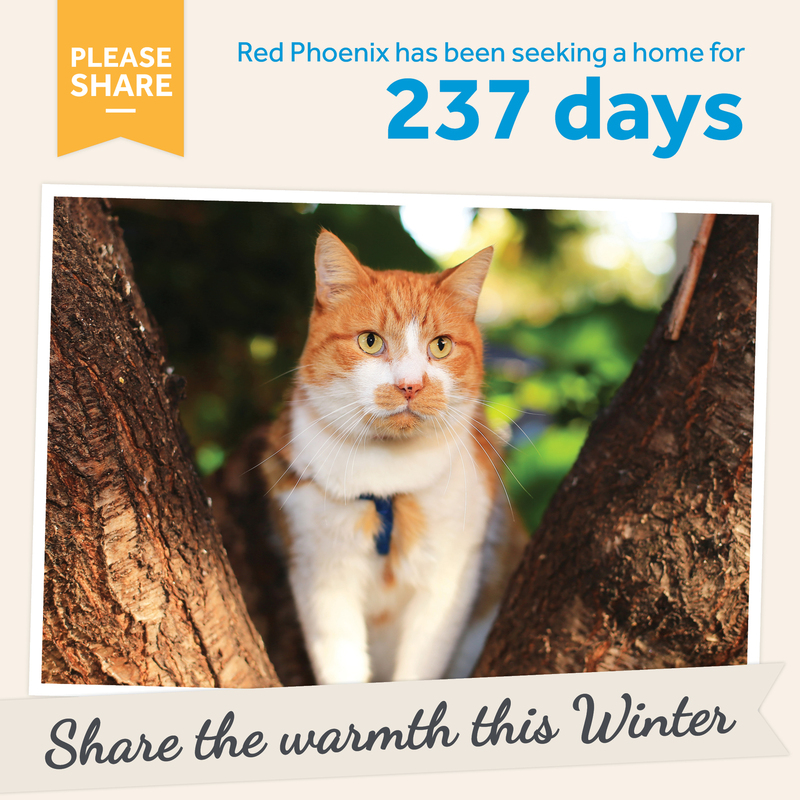 Self-assured Red has been up for adoption for 237 days at our North Melbourne shelter. He has previously had Struvite crystals in his urine and will need to be kept on a special diet, but his food can be purchased at most vets and large pet stores. An alpha male at heart, Red will need to be the main feline in your house, but he is a loving companion who will enjoy nothing more than hanging out with his new family. To find out more about Red, check out his profile here. With his majestic yellow eyes, delightful Dudley is a domestic short haired cross, who has been a resident at our Campaspe shelter for 200 days. Dudley is always keen to explore his surroundings, so much so that it is hard to believe that this loving six year-old! He is also a very chatty cat with a distinctive meow, which makes him stand out from the crowd. 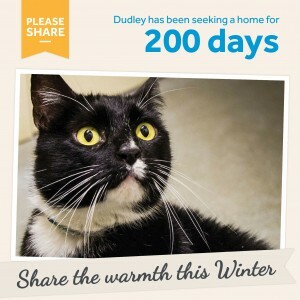 Want to find out more about Dudley? Then check out his profile here or come and meet him in the fur at our Campaspe shelter at 520 McKenzie Road, Echuca. When you first meet this handsome one year-old, you might notice that he can come across as a bit timid and shy. However, after a while, when he comes out of his shell, Reginald will with your heart with his inquisitive and playful nature. During his time with us, Reginald has been kindly sharing his cat condo with other cats and kittens looking for their forever home. This means that he is open to living with other cats! 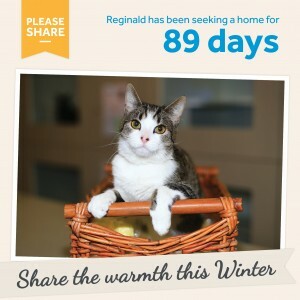 So if you have been waiting to adopt another cat, maybe Reginald is the cat for you? 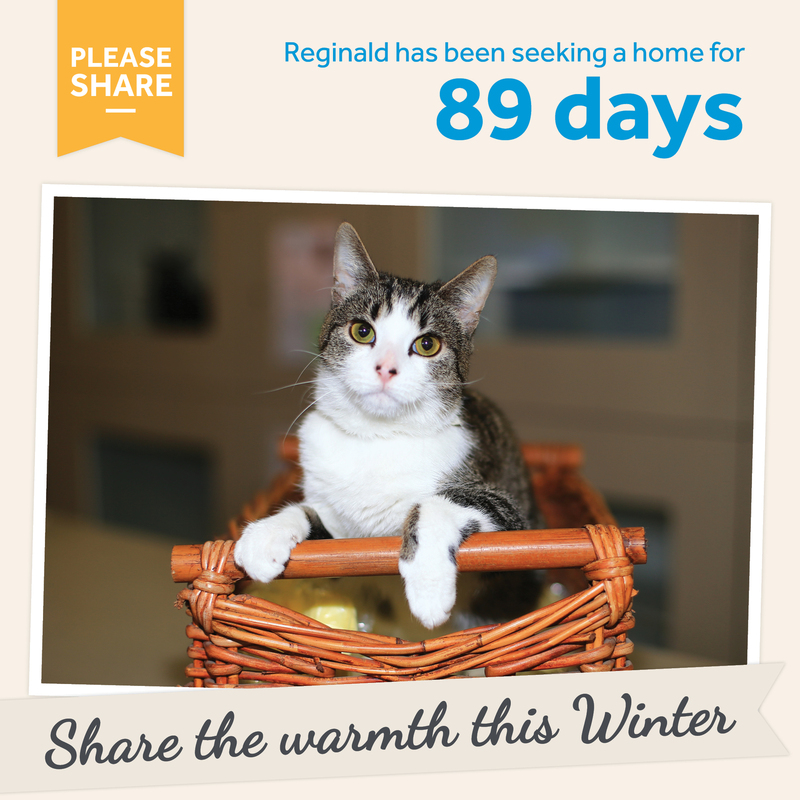 Reginald has been up for adoption for 89 days at our North Melbourne shelter. You can find out more about him here or go and meet him in the fur at 2 Gracie Street, North Melbourne. Adopt from May 5 – 31 and receive fee waive adoptions for cats six month and over and 50 per cent off the adoption fee of kittens under 6 months.